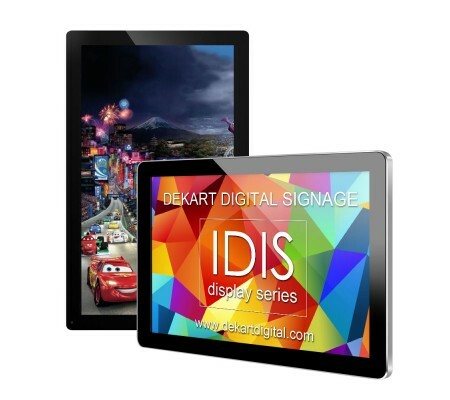 IDIS-650 — interactive idis related to the category of universal ad screens with a large 65 inch advertising dispaly and media player for advertising. It is designed to reproduce vivid messages, advertisements, and can be placed at the point of sale, halls of hotels, exhibition halls, i.e., in all places of the big congestion of people. Key features of electronic digital signage display IDIS-650 are a large screen, automatic display of advertising slides, videos with audio, and optional support for Ethernet LAN and wireless WIFI standard b/g/n, 4G Internet. Embedded network advertising player allows you to quickly download and update schedule and media on one or multiple monitors. 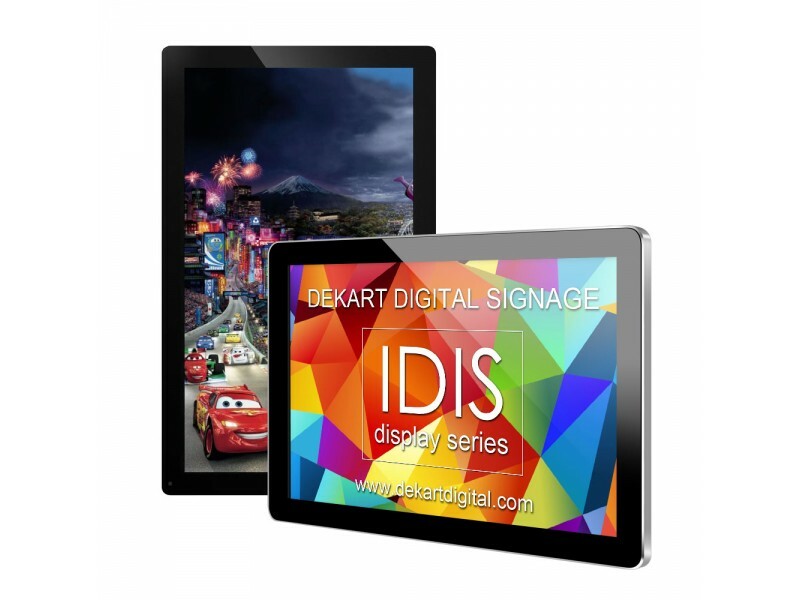 Touch screen option can upgrade digital advertising monitor IDIS-650 to a large interactive display. Then it will support multitouch, play, graphic and video formats for Full HD and 4K. This screen can become an interactive platform with high quality and effective personalized content, and the ability to upload information to/form the Internet. Default multimedia advertising player built into the device support audio, video and still images form a USB flash, or SD/SDHC card. IDIS-650 can be produced to work with Windows, Linux, or Android operating system to the customer's choice. This allows you to quickly install and update the system in the right place at the right time. IDIS-650 is fastened using brackets, VESA standard mounting, either vertically or horizontally. Use standard VESA mounting to fix IDIS quickly and safely in a crowded place. We sell Commercial Displays around the world. We can manufacture Commercial Displays with screen sizes from 10 to 150 inches. Call or email us now to know the price and delivery time!